Following on from its NODA award winning concert last year, the Thornbury Musical Theatre Group invite you to join us for our Summer showcase which will take you on a cinematic journey, bringing you the best of the big screen tracks. In this spectacular serenade of the silver screen, ‘A Night at the Movies’ will entertain you with singers and dancers galore, with music from a vast variety of films across the ages in the form of emotional power ballads, romantic duets and toe-tapping high-energy dance numbers. Looking to provoke memories, the concert includes songs about love, heartache, imagination, childhood and dance to name a few. For a fully immersive, wonderful evening of entertainment, join us at the Armstrong Hall in Thornbury, after which you will undoubtedly leave with a smile on your face, your toes still tapping and haunting melodies ringing in your ears. 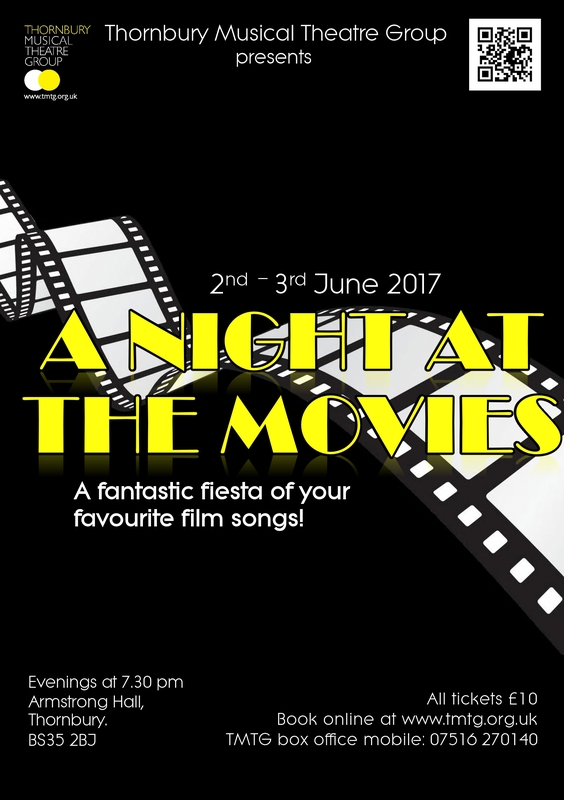 Don’t miss this fantastic fiesta of your favourite film songs, complete with a live band, just like the good old classic films. And that's a wrap! Thank you so much to all of you who came to see "A Night at the Movies" and of course a massive congratulations to our cast and crew who worked so hard to produce such a fabulous show. See you in October for our 2017 main show "The Wedding Singer"! Thank you to Celebration Roadshow for all the help with "A Night at the Movies". Last night's performance certainly seemed to go down well with the audience and we are so excited that tonight is SOLD OUT! Opening Night - Get your popcorn! Half an hour to go until the opening of "A Night at the Movies". Oh yes, and did we mention we have candy floss and popcorn?! Read more about Opening Night - Get your popcorn! Have our fabulous displays in Thornbury tempted you to buy your tickets for "A Night at the Movies" yet? It's exactly one week until our first dress rehearsal eeeek! Band and cast met for the first time today at our "A Night at the Movies" band call. Just a week and a half to go! Tickets are selling fast, get yours before they go! Read more about Who has spotted? Fantastic work going on at rehearsals for our summer concert "A Night at the Movies", here's a taster of what we've been up to! With music from a vast variety of films, in the form of power ballads, romantic duets and high-energy dance numbers, you will leave the Armstrong Hall with a smile on your face and your toes still tapping. We will be performing at the Armstrong Hall in Thornbury from 2nd-3rd June at 7:30pm, so get the popcorn and the hot dogs - we can guarantee this show is an Oscar winner! Only a couple of days left to enter our "A Night at the Movies" competition on MyThornbury. Win a pair of tickets to the show! We're always so grateful to Lisa Costa Residential Sales & Lettings for hosting our Thornbury box office, most recently for our June concert "A Night at the Movies". Well done again. Such a fabulous performance last night. Had my 94 year old mum dancing all the way home.